THE Health Professional Council of Zambia (HPCZ) has warned some health workers allegedly in the habit of posting pictures of the dead on social media to stop because it is unethical to do so. Recently, the country has witnessed a growing trend of posting photos of deceased persons in hospital beds on social media platform such as WhatsApp and Facebook. 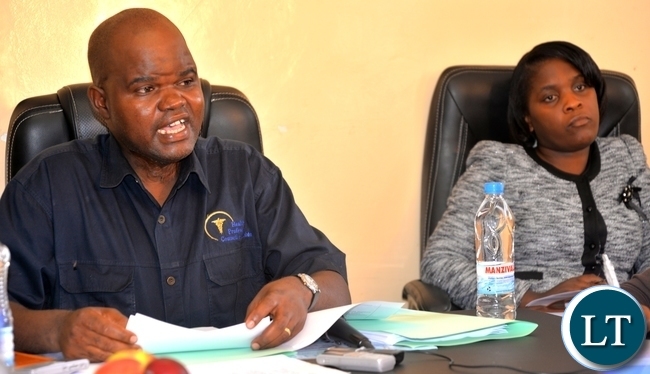 HPCZ spokesperson Terry Musonda in an interview yesterday said the trend is unprofessional and must be condemned. Mr Musonda said the Patient Rights and Responsibility Charter is clear that every patient has the right to physical privacy and confidentiality. “Therefore, even in death, a patient’s rights should be protected and safeguarded at all times,” he said. He appealed to family members aggrieved to report to the council so that it can commence investigations. “If the postings are coming from health facilities, the health workers should desist. It is against the Zambian culture for some people to reach an extent of posting pictures of dead bodies,” Mr Musonda said. LT picture captions are awful! I cannot identify Terry Musonda in that picture. I hate even posting accident pictures. And that Muvi TV, I wish it was closed forever that time PF suspended the licence. Middle? There are only two people in the picture. This is a repugnant “tradition” (as some people want to claim tradition for every despicable act). What do you learn from a dead body – whether in a hospital bed, on a road or in a coffin? Why are some people so obsessed with “sharing” awful pictures? For me, there’s no joy, there’s no learning opportunity, in seeing a dead body. This is not related in anyway to the story but bloggers what is happening to our town center and residential areas. Is it a deliberate ploy to have cholera resurface. Just go to the area around Stanley Bar on freedom way and see the disgust, go to Mandevu, Chipata Compound, Kanyama. Its hell………………..prepare for the worst ladies and gentlemen especially that the drainage system is so pathetic all the garbage is mixing with the waste we are compelled to step in and the rest you can conclude. I agree. Unfortunately standards are now so low that everything is left to nature to take its course – “ifintu filaisova” . I haven’t set foot in Zambia for close to three decades for fear of contracting some dreadful disease arising from the filthy environment. Now that you people saddled with leadership more concerned about stealing, drinking, dancing, fighting among themselves, the repugnant situation will only get worse. You people had a chance to employ a more professional party to manage govt affairs but you opted for thugs. Now you are reaping and will continue to do so for next three or four decades of Lungu’s alcohol fueled leadership style. @Wantanshi , You are not the only one that travels outside Zambia, I am in the USA living well, but I would never forget or trash my homeland Zambia. So please keep your slave mentality to yourself and quit exposing yourself to be an !diot you sound to be. You probably have not set your filthy foot in Zambia because you can’t afford it because of your pathetic job you do wiping old people’s butts in nursing homes, or you are an illigal immigrant who has over stayed your visa and is scared to leave the USA. Stop being a fool by dising Zambia, it shows how ignorant you are. Who is going to stop us?? Just like drinking “Shake Shake ” opaque beer at grave yards should be stopped. We have lost respect for the dead. Ignorance.Even the accident should not be accessed by anyone.Only police fire and ambulance services.Not the whole public with their phones.No respect at all. If Terry is the one with a double decker head, then his picture should not have been put there, he appears to be dead. Even confused LT into seeing someone in the middle of the 2 people in the picture. Thank you someone has spoken about this. One wonders where the Human Rights Commission is in all this. What are people paid to do in Zambia kanshi? That body of Malambo and all the victims of road traffic accidents are posted on social media, sometimes before all the relatives or next of kin are even informed. This needs to stop and has nothing to do with Zambian culture because in the western world you would be arrested, culture or no culture. Eh! That Airbus on his shoulders!! @Wantanshi , You are not the only one that travels outside Zambia, I am in the USA living well, but I would never forget or trash my homeland Zambia. So please keep your slave mentality to yourself and quit exposing yourself to be an !d**t you sound to be. You probably have not set your filthy foot in Zambia because you can’t afford it because of your pathetic job you do wiping old people’s butts in nursing homes, or you are an illigal immigrant who has over stayed your visa and is scared to leave the USA. Stop being a f** by dissing Zambia, it shows how ignorant you are.. This is what makes news in Zambia,pathetic im surprised no one used the ‘its a christian nation nonsense’!